One of the reasons why FUNimation rose to power to become over a third of the entire American anime market is because they releases a number of the most popular anime titles in America. Dragonball Z, Afro Samurai, and of course, Fullmetal Alchemist. 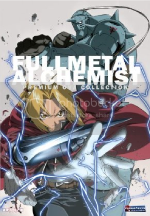 The company has already released the first Fullmetal Alchemist TV series and movie, and they are currently simulcasting the brand new Brotherhood TV series with intentions of releasing it on DVD next year. But the franchise is so darn popular that the company decided to bite the bullet and license the 24 minute long Premium OVA Collection. The collection contains four segments. The main segment, a mini-series entitled “Seven Homunculi vs. State Alchemist”, is the most interesting of the bunch. It puts the viewer in a first-person perspective of an aspiring state alchemist. You go through training and then you are suddenly thrown in battle along side Ed, Al, and the rest of the cast. First-person perspective is something that you’ll rarely find in anime, so I thought this was a very interesting take on the FMA universe. The other three segments aren’t nearly as intriguing as the main one, but each has its own charms. The “Chibi Wrap Party” is a goofy skit of the FMA characters celebrating the completion of the FMA movie. “Kids” is a very heartwarming piece showing childish versions of Ed, Al, and Winry playing through out a city. And there’s a weird and surreal live action segment that shows a life-size statue of Al traveling through out Tokyo. Sure, it’s just a collection of DVD extras, but each segment is very amusing and should entertain any fan of the series. And with a MSRP of only $15 (with some places selling it for under $10), I think it is a DVD worth adding to your FMA collection. This entry was posted on Wednesday, July 29th, 2009 at 12:31 pm by Scott	.